In mid-January we explained the “DNA of SPX” around all major sell offs since the financial crisis lows. All bigger pullbacks (10% and more) have been playing out in a similar fashion. The bounce, post every sell off, has ended up with the following move lower revisiting the initial low mark (you can see it as a double bottom). The time period between the first and the second low has lasted around 30 days, give or take a few days (you can read that post here with sell off charts from 2010, 2015, 2016 etc). 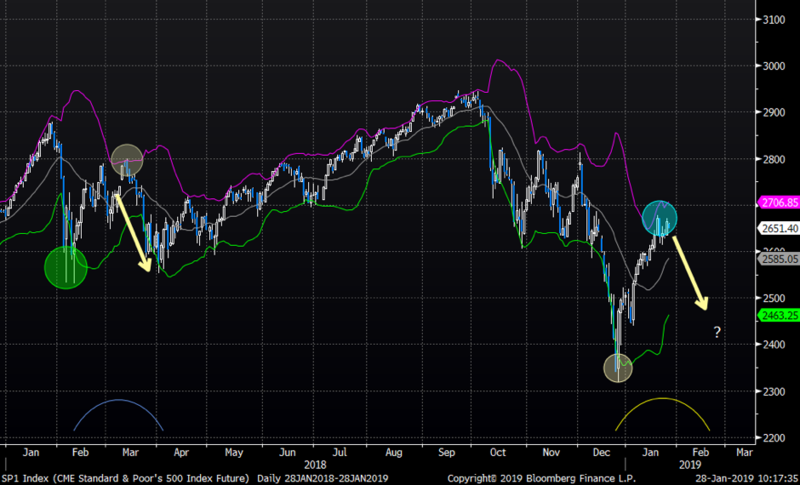 If SPX is to continue to follow the DNA of all major moves lower since 2010 as well as the subsequent bounces, there is some limited upside left if we are to test the Bollinger bands (note the Bollinger bands would come “down” even if markets consolidated for a few sessions). Should the move after that also follow the same DNA, we could expect the SPX to revisit those panic Christmas lows in early February. 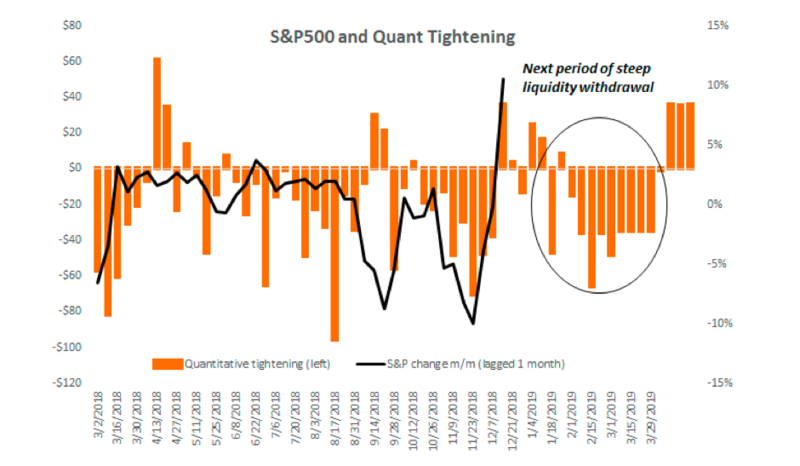 Given the fact the dynamics have been playing out in a similar fashion since 2010, the recent pullback in global equity volatilities could prove to be a great trade to revisit. Gamma is king! So, what has happened since then? The SPX did the “there is some upside left” price action and touched the upper Bollinger Band briefly. The bounce since the Christmas lows has been very violent and has managed confusing most investors. Psychology among investors here is rather complex. Our recent logic is that the bounce has got ahead of itself, and that one should be dancing very close to the exit. Long convexity trades are offering interesting set ups in our opinion. If the SPX is to continue following the DNA of all major pullbacks since the financial crisis, coming few days will be rather important. 2600 is the first big support to watch. 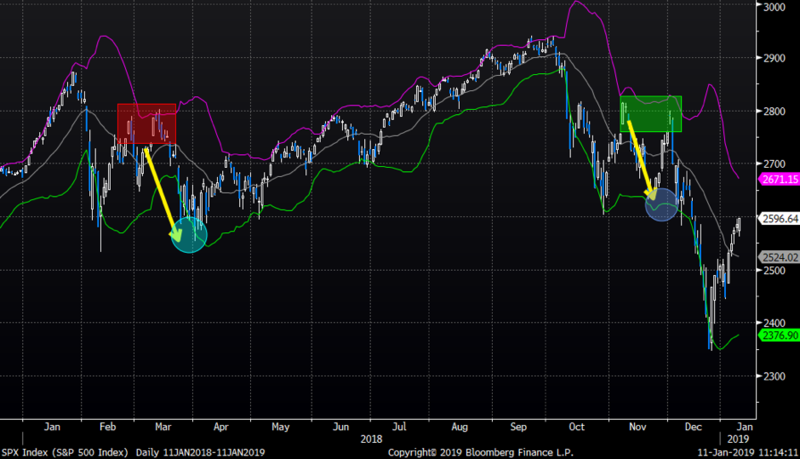 The sell off a year ago had the SPX touch the lower Bollinger Band, then the index bounced to the upper band and finally some 35 ish days from the first low, the SPX retested that same low. If we were to see the same “DNA” unfold, the SPX would start the descent soon and test some kind of low in mid/late-February. Note that the Christmas panic low level was most probably exaggerated by the fact liquid was extra low due to holidays, which extended the move lower according to us. Either way, we are watching price action carefully here, especially as the Fed will be busy draining liquidity soon.